Redlands, California—Esri, the global leader in spatial analytics, today announced that it will be hosting the 38th Annual Esri User Conference, to be held July 10–14 at the San Diego Convention Center. 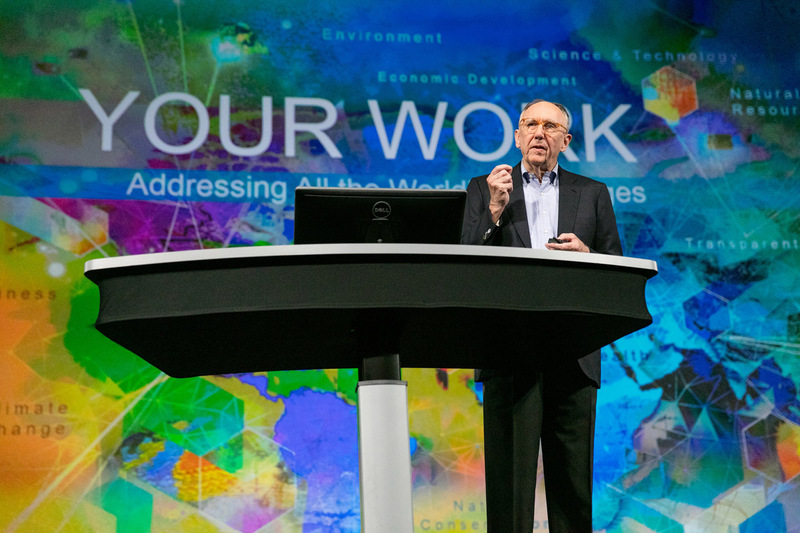 Renowned author and theoretical physicist Dr. Geoffrey West will join Jack Dangermond, Esri founder and president, on the plenary stage at the world's largest GIS event. West is a distinguished professor at the Santa Fe Institute. His latest book, Scale: The Universal Laws of Growth, Innovation, Sustainability, and the Pace of Life in Organisms, Cities, Economies, and Companies, explores dynamic growth and the challenges of achieving that growth sustainably. Published May 16, West's new book has been praised by the scientific journal Nature for its "important and eloquent case for the significance [of universal laws of size and growth] in an ecology of the natural and human world." The annual Esri User Conference is the destination for international technology experts, educators, and GIS users from every discipline—including commercial businesses, governments, and nonprofits—seeking to unlock the hidden potential of their data. "Today's businesses and governments require new ways of thinking," said Dangermond. "Our users are leading the charge, using mapping and analytics to empower digital transformation, accelerate understanding of big data, and democratize technology. It is an inspiration to see how so many different organizations are applying the science of geography and the technology of GIS to gain insight into their data and reveal hidden patterns and spatial relationships." The Esri User Conference offers inspirational guest speakers, an enormous Map Gallery, software workshops, technology demonstrations, and hundreds of discussions led by users and GIS experts. For more information and to register, visit go.esri.com/pruc.